Hello Omaha locals! Come see me tomorrow at Omaha Fashion Week Buyer's Market! Here is a sneak peek of some new low cost items that I will have. I will also have a rack with my clothes on it that you can look through, and even try things on if you like. 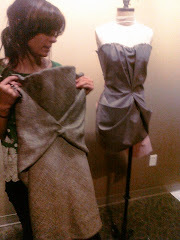 Not everyone is a sample size 4, but you can see the construction and details up close and feel the fabrics! Maybe you will find something that you would like custom made, or perhaps just be inspired by the shapes and details. If you want to see everything, you will just have to come to the event (it is free to get in). Don't be afraid to bring your friends and check out what all the local design talent has to offer! Nomad Lounge - 1013 Jones St.
"You saw the pieces on the runway during Omaha Fashion Week 2010; now is your chance to make a purchase!